Khloé Kardashian and Kendall Jenner defend making money moves! In an interview with the New York Times published over the weekend, the Kardashian-Jenner family — including Kim, Kourtney Kardashian, Kris, and Kylie Jenner — discuss their various business deals, including their most controversial endorsements. Related: Kim Kardashian Didn’t Expect Baby No. 4 To Happen! 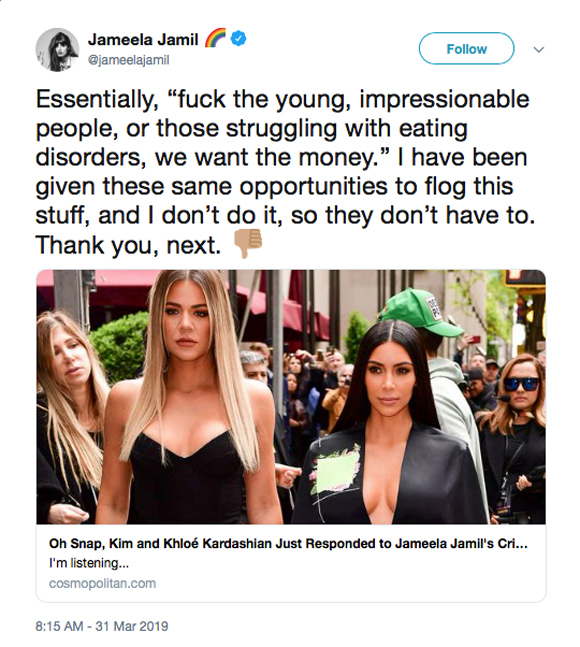 In the piece, the Revenge Body host was asked about comments made by frequent KarJenner critic, Jameela Jamil. In response, KoKo — who the author noted was “fresh from a workout” — said she has never hired a chef. While she does have a personal trainer, she posts her exercises on Snapchat for everyone to view. In the interview, Khloé also revealed that, nowadays, she tries to forge “authentic” partnerships as opposed to her past business deals. As for Kendall, the model defended her partnership with Fyre Festival, the disastrous 2017 music extravaganza founded by current-inmate Billy McFarland and rapper Ja Rule. According to court documents obtained by ET in January, the 23-year-old’s company was paid $275,000 for services including promoting the festival on Insta. Yeesh. Hopefully the KarJenners will learn from their past mistakes! The post Khloé Kardashian & Kendall Jenner Defend Their Sketchy Endorsement Deals! appeared first on Perez Hilton.